GONZALES, Louisiana -- A young girl's innocent gesture is winning over the hearts of hundreds. 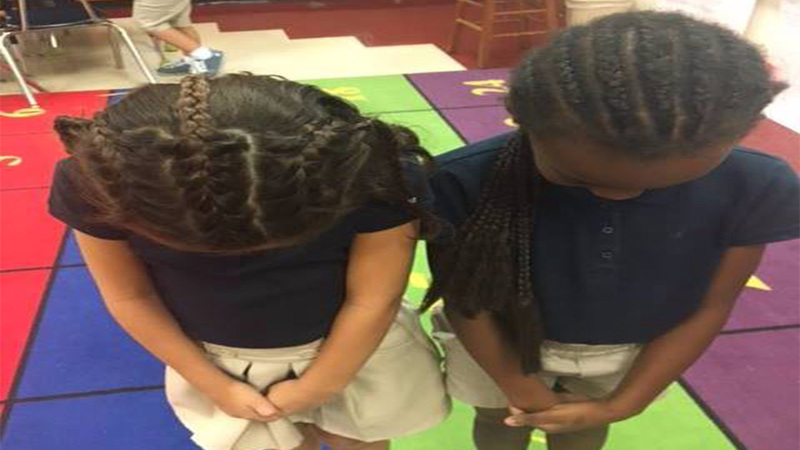 On Friday, a second-grade student in Gonzales, Louisiana, asked her mom to braid her hair in a similar style to her best friend so they could be "twins" at school. "They've been BFFs since kindergarten," said Brigette Diez Kerr in a Facebook post. "They are in 2nd grade now. My daughter got up the other morning for school and asked that I fix her hair like her best friend wears her hair. She wanted tiny braids just like her." At first, Diez Kerr said she was hesitant to braid her daughter's hair because she thought she'd be bullied for embracing other cultures; however, when she heard a local pastor speak about intentional and unintentional racism, she realized her fear was an example of unintentional racism. "My pastor just spoke this past Sunday morning of intentional and unintentional racism," she said in her post. "I am by no means intentionally racist. I have dear friends and coworkers I love that are of many ethnicities. But was MY fear of my daughter being stereotyped a form of UNintentional racism?! I WAS CONVICTED! How dare I push MY fear, my UNintentional racism, onto my daughter who sees no color, no stereotype, no hate, no 'white girl hairstyle' or 'black girl hairstyle?' She only sees pretty hair on her best friend. She shows love to ALL people without hesitation." Diez Kerr said she did her best with the braids but her daughter didn't seem to mind that they weren't "perfect." "She smiled from ear to ear this morning and she couldn't wait to get to school to show her best friend," said Diez Kerr. But this mom feels her daughter's actions have a deeper meaning that the world needs to hear. "I know so many people who claim to not be racist," she posted. "Maybe you aren't intentionally being racist but are there some decisions you are making or thoughts that you are having that may be considered UNintentional racism? We are called to love our neighbor as ourselves! Let's do a better job of showing this love."